Available exclusively through Sjodin Communications. Please call our office direct at (949) 723-3132 and a customer service representative will be glad to assist you. A practical companion to Small Message, Big Impact, this workbook will help you transform inspired thoughts into tangible results. Exercise by exercise, you will follow a road map to craft an elevator speech for your message. Each session was created to spark your creativity, generate ideas, and spur you to action. The questions and activities were chosen with both individuals and groups in mind and can be applied across a full spectrum of professions and endeavors. 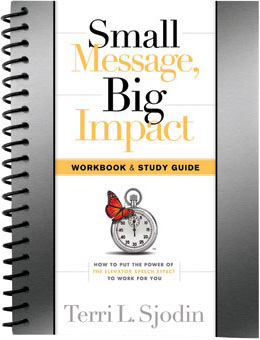 Use this workbook after you read Small Message, Big Impact as part of a book club, study group or spaced learning program and put the Elevator Speech Effect to work for you! Are you interested in the Workbook/Study Guide Edition? It’s available on disk or email format, please contact our office directly for more information and special, multiple-user pricing options.